O God, author of our freedom and of our salvation, listen to the voice of our pleading and grant that those you have redeemed by the shedding of your Son's Blood may have life through you and, under your protection, rejoice for ever unharmed. Through our Lord Jesus Christ, your Son, who lives and reigns with you in the unity of the Holy Spirit, one God, for ever and ever. An Explanation of the Sabbatine Privilege | Rev. Eamon R. Carroll O. Carm., S.T.D. According to the 1962 Missal of St. John XXIII the Extraordinary Form of the Roman Rite, today is the feast of St. Ubaldus, Bishop of Gubbio. He is remembered in central Italy as a Bishop who was entirely devoted to the duties of his office. He led a life of exceptional austerity. He belonged to the Order of Canons Regular of St. Augustine. He died on May 16, 1160. 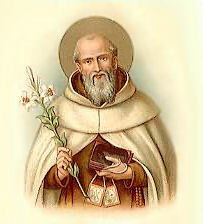 Historically today is the feast of St. Simon Stock, a hermit who became a member of the Carmelite order. He received a vision of the Blessed Mother promising salvation to all those who wore the brown scapular which she showed him — a vision that led to the widespread devotion to Mary over the next centuries of wearing this scapular in her honor. 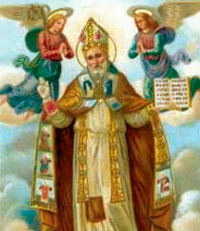 The saint was born in Gubbio, Italy, was ordained a priest, and made a canon. Against his own wishes but upon the request of Pope Honorius II, he became the bishop of his native city in 1128. In this capacity he was a model of apostolic simplicity, pastoral zeal, and personal holiness. His aid is popularly invoked against evil spirits. To this day his body remains incorrupt. The power St. Ubaldus possessed against evil spirits was evident. The Church moves in a spirit world--good angels are all about, while constant vigilance is exercised against Satan and his devils. The liturgy contains a considerable number of exorcisms and adjurations. Then there are a series of sacramentals directed against the power of evil spirits; for example, holy water, palms, candles. Hold these sacramentals in highest esteem. Little is known of his early life. Legend says that at age twelve he began to live as a hermit in a hollow oak tree. The name Stock is believed to be derived from the old English for tree trunk. He was an itinerant preacher and a pilgrim to the Holy Lands, but he left when invading Muslims chased out Christians. He joined the Carmelite Order soon after its arrival in England. He lived and studied for several years in Rome and Mount Carmel. He was elected sixth general of the Carmelites in 1247 around age 82. He helped the Order spread through England, southern and western Europe. He founded houses in Cambridge, England in 1248, Oxford in 1253, Paris in 1260, and Bologna in 1260. He revised the Rule of the Order to make them mendicant friars instead of hermits. Regardless of these successes, the Order was oppressed on all sides, including by the clergy and other orders. The friars took their woes to their patroness, the Virgin Mary. Tradition says that in answer, she appeared to Simon bringing him the brown scapular of the Carmelites. "This shall be the privilege for you and for all the Carmelites," she told him, "that anyone dying in this habit shall be saved." On 13 January 1252 the Order received a letter of protection from Pope Innocent IV, protecting them from harassment. One day an itinerant monk named Barrind visited Clonfert and shared with Brendan and his brothers how he and a hermit named Mernoc had undertaken a voyage to the Promised Land of the Saints. Barrind described sailing to a land in the west, where they walked about for fifteen days without needing to eat or drink. Reaching a river, they met a man who told them many things about this strange Land, which, he said, had been there since the creation of the world. He instructed the two travelers to return home, and escorted them back to their boat, whereupon they set sail and returned to Mernoc's monastery. Enthralled with Berrind's tale, Brendan selected fourteen monks from his own community and confided to them his desire to visit the Promised Land of the Saints. After praying and fasting, Brendan and his companions set out for Inishmore of the Aran Islands to seek the blessing of St. Edna. Near a small creek under a mountain now called Brendan's Seat, they pitched camp and built a small wood-framed boat, covered in oxhides tanned with oak bark, and smeared the joints with animal fat to seal them. In the boat they placed supplies for forty days and other equipment. As they prepared to set sail, three strange monks approached them, asking to be taken along. Brendan agreed, but warned that two of them would endure a hideous end, and that the third would not return from the voyage. Brendan and his companions sailed westward for fifteen days until they lost their bearings and drifted to an island which looked like a huge rock tower with streams cascading down its cliffs. Finding a small harbor, they landed, and were greeted by a dog which led them to a hall where they found food set out for them. They stayed for several days, and the whole time they were on the island they saw no one, yet always found meals set out for them. After three days, as they boarded the boat to leave, one of the three monks who had joined them went into a fit. A demon leaped from his breast, and he died. It was then discovered that he had tried to steal a silver platter from the hall. Their journey next took them to a large island called the Island of Sheep because of the numerous flocks which roamed its hills. They stayed there from Holy Thursday through Holy Saturday. While there, a man known as the Steward provided for them, and gave them fresh meat to take with them. He instructed them to travel to another island to celebrate Easter. Soon after leaving the Island of Sheep, they found a small barren island and landed there. But when they lit the fire to roast some of the meat they had been given, the island began to shake and move, and the monks scrambled back into their boat. They watched as the island moved away, their fire still burning. Brendan informed his monks that the "island" was in fact Jasconius, the largest whale in the ocean. Across a channel from the Island of Sheep the travelers found the Paradise of Birds, with a river leading inland. A mile upstream they discovered a huge tree covered with white birds. At vespers and at other times the birds burst into hymns and verses. One of the flock flew down to the boat and began speaking to Brendan, informing him that he and his companions would search seven years before reaching the Promised Land of the Saints. Throughout their stay on the Paradise of Birds, the Steward brought them food and water and provided for all their needs. When the Feast of Pentecost came, the Steward instructed them to set sail once again. And so it happened. During one of these times the monks saw speeding toward their boat a huge beast spewing foam from his snout, looking as though it will devour them. The monks cried out in fear, but just as it drew next to the boat a second beast came from the west and attacked the first beast, cutting it into three pieces. Then the second beast swam back the way it had come. On another occasion a flying griffin attacked their boat, but before it could strike, a large bird dove out of the sky and killed the griffin. One day the companions came upon an island on which they found three choirs—one of boys, one of youth and one of elders. Throughout the day they sang the praises of God. A cloud of extraordinary brightness covered the island from dusk till dawn. When the travelers were ready to leave, the choirs invited one of the three monks who had joined Brendan's company to stay with them on the island. With Brendan's blessing, the monk remained. After this the wind blew them to a rocky, barren island from which came the sounds of hammer and anvil. Filled with apprehension, Brendan and his companions made a valiant effort to row away, but an islander appeared from out of a forge and threw a huge piece of slag at them. It flew over their heads, and when it fell into the sea, the water boiled and hissed. Other islanders rushed to the shore, likewise hurling slag at the boat. The water all around the Island of Smiths steamed like a furnace, and a horrible stench arose. Brendan informed his companions that they were on the edges of Hell. Finally the travelers reached an island where Brendan found an ancient monk sitting at the entrance to a cave. The ancient one told Brendan he had been a companion of St. Patrick and had been a hermit on the island for ninety years since Patrick's death. The hermit instructed Brendan to return once more to the Island of Sheep and once again to the Paradise of Birds, and after that he would be led to the Promised land of the Saints. There he and his companions would stay for forty days, and then be brought safely home to Ireland. After receiving the ancient monk's blessing, the companions sailed off and came to the Island of Sheep where they were once again attended to by the Steward. This time when they prepared to leave the Steward joined them in their boat. Next they met Jasconius who brought them on his back to the Paradise of Birds. After filling their water vessels, they companions set sail with the Steward as their guide, for, he said, without him they would never find the Promised Land of the Saints. On the fortieth day a great fog swallowed up their boat. The Steward told them that the fog always surrounded the land for which they had been searching these seven years. An hour later a brilliant light shone forth, and the boat touched shore. The monks disembarked and found a beautiful land filled with fruit-laden trees. They explored the land for forty days, never coming to the end of it. But on the fortieth day they discovered a wide river, which Brendan said they should not cross. A young man approached and greeted each of them by name. He explained that God had delayed them in finding the Promised Land of the Saints so that they might discover many things along the way. He instructed them to gather up fruit and supplies and to set sail for, he said, Brendan's last days were near. The Promised Land, he assured them, would be made known to Brendan's successors at a time when Christians were being persecuted, so that they might find a new home in peace. Brendan and his companions gathered up fruit and, taking their leave of the Steward, sailed out into the fog. They came again to the island of the ancient hermit, and stayed there with him for three days. Then they set sail once again and returned safely to Ireland. The monastery at Clonfert greeted him with great joy, and he recounted to them everything which they had encountered on their journey. Finally he told them of his approaching death, as foretold by the young man. After making everything ready, Brendan received the sacraments, and soon thereafter died among his companions in about the year 570. 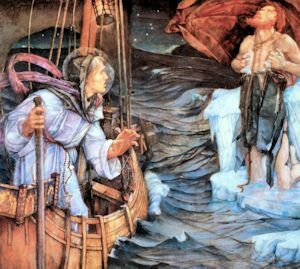 While the story of The Voyage of Brendan is filled with fanciful images, many modern scholars believe it has an historical foundation. Some claim that Brendan's voyage brought him to the shores of North America, making him and his companions the first Europeans to reach the continent—nearly a thousand years before Columbus. In 1977 a modern navigator built a replica of Brendan's boat and retraced his route across the Atlantic to Newfoundland, proving that such a journey was indeed possible. Whether or not Brendan's voyage is historically factual, the story speaks to us throughout the centuries. We, too, are on a journey. Our God has invited us to travel with our companions, and to invite others to journey with us along the way. We are cared for by the Steward and often make the journey through the years from Epiphany to Holy Thursday to Easter. We encounter many strange and wonderful things along the way. And, in the end, we, too, are promised that we will be brought safely home. 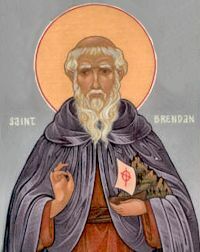 Read more about St. Brendan at St. Brendan the Navigator. Purchase the Voyage of St. Brendan. Did St. Brendan Reach North America 500 Years before the Vikings? Read more about his at National Geographic. Learn more about Fenit Harbor, St. Brendan’s birthplace. Who are the Twelve Apostles of Ireland?